There are many options available for flooring covering. Some really great innovative products have been introduced to the market over the past decade, using recycled materials, bamboo, pretty much anything durable, the sky seems to be the limit. Carpeting and rugs are not new to the market, but continue to be a popular choice for their durability, convenience and, above all, comfort. Carpet and rugs seem to warm a room and make it more inviting and cozy than other materials available. Both are made from the same materials, but the shapes, sizes and installation vary greatly. Carpeting is a material that is used on the floor that can be made from wool or nylon. It is known for its comfort and durability. It comes in a variety of choices from style, to color to material. It is installed from wall to wall, that is, it is adhered to the floor so as not to be removed or moved around. It is a permanent structure that remains on the floor, usually glued down to the structure below it, or nailed depending on the installation process. Rugs are made from the same materials as carpeting in most cases and they are made using the same process. Rugs come in a wide variety of sizes, shapes and colors and most rugs are more colorful, having a tendency to be available in more variations, with brighter colors, and more patterns to match the decor of a room. Rugs, unlike carpeting, are removable as they are not tacked down to the floor. Rugs are purchased to be placed over existing flooring, not to be the main flooring, but to accent the room and soften up a harder surface flooring like tiling or hardwood. The edges of a rug are defined sometimes with just a plain edge, while other more elegant pieces have ruffles and or fringes. 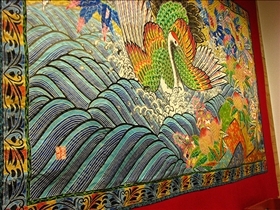 A tapestry is a picture that is created using the same materials as carpeting and rugs. It is not usually, if at all, used as a flooring material. 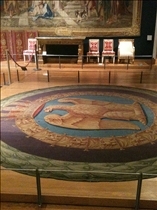 A tapestry is a cloth picture, literally, like a painting, but it uses carpeting material in a pattern to create a picture or a scene. It is normally hung on the wall as opposed to being placed on the floor. Rugs and carpeting are both made from the same materials but they are placed on the floor, not hung on the wall. People make their choice of flooring depending on what the room to be covered is going to be used for. There are so many different options to chose from on the market, sometimes the choice is overwhelming. Rugs offer the option of combining durability with removable comfort that can be replaced easily and cleaned as well, while carpeting is a permanent independent flooring option. Both rugs and carpeting are for use on the floor the level of cushioning is dependent on the base padding and the quality of the fibers used to make the floor covering. Cheaper rugs usually matte down sooner than better quality fibers. Which one should you splurge on?